Look at all the acronyms. 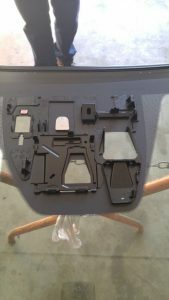 Most of my readers already know what these mean: ARG – Aftermarket Replacement Glass, OE – Original Equipment Glass, and ADAS – Advanced Driver Assistance Systems. You probably also know the problems we have been having lately. In this blog, I will attempt to explain why some ARG parts cannot be used in (some) vehicles that have been equipped with an ADAS. The first thing to understand is that fractions of an inch make a huge difference. When aiming a projectile or a beam, any fraction of an inch movement at the source will result in huge differences at the target. It may result in the target being missed completely. If the opening that the projectile or beam must go through is limited in size and configuration, then the aiming is limited to that opening. Recalibration is the aiming of a lens of a camera or a beam at road markings to align, stop or steer the vehicle. If the aiming of that device is off by even tiny fractions of an inch, it can mean the difference between life and sustaining injury. If you notice, most glass parts used in a vehicle with ADAS have a unique parallelogram cutout in the third visor frit near the mirror. This cutout has the parameters that the camera, laser or LIDAR (Light Detection and Ranging) can be aimed through or adjusted within. If that cutout is smaller, deformed or misplaced, the aiming device may not be able to be adjusted to meet the criteria of the vehicle specifications. It is imperative that the frit cutout is precise to allow for adjustment. Now add to that the mounting bracket attached to the interior windshield surface. If that bracket is off another fraction of an inch, that can compromise the calibration as well. Frankly, I can understand the carmaker’s requirement of OE parts being used when ADAS is present. Do I find this as a problem for my business of auto glass replacement? Yes, I do. It means that I must order my glass from the appropriate dealer, then wait for delivery to that dealer, then spend time to pick up the part at the dealer and finally pay the dealer a much higher price than an ARG part. If the glass was not damaged in shipment by inexperienced glass handlers, then I replace the windshield and take it back to the dealer for recalibration and pay another fee for the service. I find this arduous at best. I’m just being nice, it is freaking ridiculous. In a past post, I discussed my optimism in ARG glass manufacturers “upping their game.” I do believe this to be true. I believe that they will improve their “reverse engineering” practices. I believe that they will tighten their tolerances to closely match the OE. I believe that they will improve quality control standards to make them viable and competitive. Because, if they don’t, they won’t be here very long. I urge all of my readers that if they find that their ARG part is deficient in regard to safety, make your displeasure known. Retain the offending glass part in case the glass manufacturer wants it back to examine it. I also believe that “cheap” windshields will no longer be a common product. We will have to pay more for quality goods, and we will have to “up our game” as well. Will cheap windshields still exist? Yes. However, be prepared for the possibility that the ADAS will not be able to be calibrated. I believe that our industry is going to improve and be better for this technology boom. I think this safety technology will weed out the riff-raff and reward the true professionals with better quality goods, higher labor charges and more profits. If you can survive this industry-altering change, you will be stronger and better off for it. That is my belief.